I was awake shortly after 6a, sleeping in the back of my van just east of the Yosemite Park entrance at Tioga Pass. There was no one manning the booth when I drove through after breakfast and mine was the only car in the Gaylor Lakes TH parking lot just west of the entrance. I had the morning to myself which I planned to use to pursue False White Mtn, a 12,000-foot summit on the Sierra Crest I had somehow missed on previous visits to the area. I was to meet Patrick around 3:30p at Montgomery Pass in Nevada, giving me plenty of time to wander around Yosemite. I hiked up the Gaylor Lakes Trail to the crest above. Rather than continue down the trail to the lakes I turned right and headed up to Gaylor Peak for the easy bonus. On my first visit to Gaylor 15yrs ago I slept at the summit as a way to avoid getting busted by rangers for sleeping in my car (I've since learned there are easier ways to do this). The climb is an easy class 2 effort from the trail, rewarded with a fantastic view overlooking Tioga Pass, Lee Vining Canyon, Mt. Dana, Dana Meadows, Tuolumne Meadows, Gaylor Lakes and more. 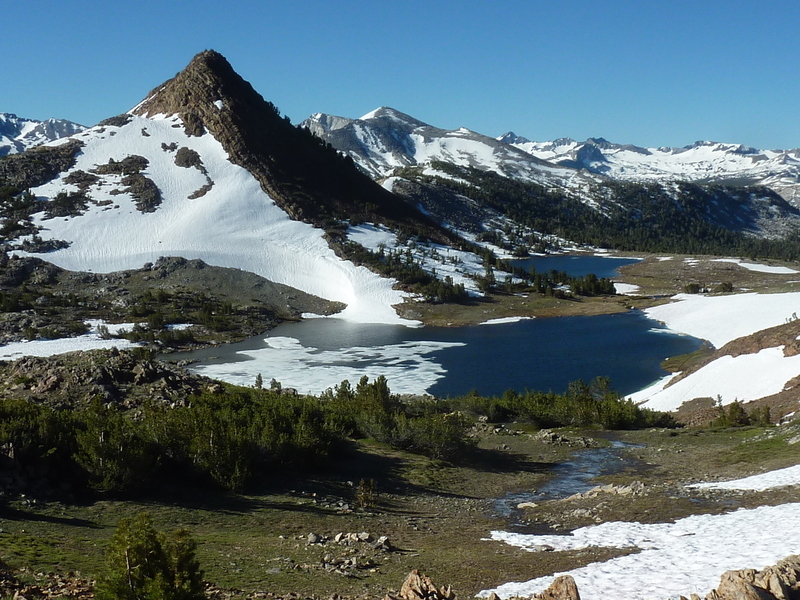 I descended the NE Ridge, following the Sierra Crest north to the Great Sierra Mine site. The only evidence I saw (to be honest, I didn't really look around for more) was a deep, unfenced mine shaft that I stumbled upon (but luckily, not into). I continued following the mostly snow-free crest north for another hour and twenty minutes, reaching the summit of False White shortly before 9:30a. I kinda expected to find a register here but came up empty after a short search. Nevertheless, the views were pretty nice and there was still plenty of snow to be seen in the high country around Mt. Conness to the north. I returned via a slightly different route, descending to Granite and Galyor Lakes as opposed to the crest route. This took me over some snow sections that allowed me to use the crampons I'd carried with me. The snow was probably soft enough to not really need them, but using them helped me justify having carried them along. And besides, crampons are just hecka fun. Lower down, I found a few other hikers trying to follow the trail through the snow near Gaylor Lakes. I simply made a beeline for the pass west of Gaylor Peak, trail be damned (since it wasn't really helping that it was buried in snow for much of the way). At the pass and over the drier south side I came across several more parties, some of which included young children that weren't too happy being dragged up the steep trail. By the time I returned to the TH after 11:30a the parking lot was completely full and there were cars slowly patroling for space, just like the mall during Christmas season. What a difference a few hours can make. Back in the van, I relinquished my parking spot to a grateful newcomer and headed east out of the park. The weekend backup at the entrance station had started and they stopped checking passes for out-going vehicles. I drove down to the Whoa Nelli where I had fish tacos for lunch. Since Matt Toomey abandoned the place a few years ago, the fare seems to have slowly moved downhill some. Still, I wasn't about to give Nicely's in Lee Vining another chance. I had quite a bit of time to kill so I logged onto the free WiFi there ("fishtacos" is, ironically, the WiFi password), which turns out to be somewhat crappy. I had to stand by the office (between the restrooms and store register) for decent reception - when I returned to any of the indoor seating, the signal was weak and dropped altogether a few times. I eventually bored of reading news reports and headed out in the afternoon heat, now hovering in the low 90s. I drove SR120 east across the south side of Mono Lake to Benton, then took US6 further east to Montgomery Pass. The small community that once called this place home has been completely abandoned, save for a Nevada DOT installation on the south side of the road. All the other buildings have been some combination of burned, gutted and/or graffitied, all of them left to slowly decay in the elements. There were a couple of big rigs pulled off here when I arrived around 2:30p. Evidently it is a popular place for truckers to catch a few winks, as there were more than a dozen that stopped by in the time I was there. At over 7,000ft the pass is not as hot as the Owens Valley or Mono Basin, but it was still 94F when I arrived, necessitating me to leave the engine and air-conditioning running. I parked under the old service station canopy which provided some key shade as I tried unsuccessfully to nap in the back. 3:30p came and went with no sign of Patrick. I started watching videos to pass the time, but several hours later I had run out of these. I began to worry that perhaps he wasn't just late, but got the meeting place wrong. The town is actually a short distance east of the pass so I started driving back west to the pass to see if he might be waiting there. In doing so, I must have gotten a weak cell signal somewhere along the way that let me receive a couple of texts from Patrick indicating he was now expecting to arrive between 6:30p and 6:45p. Back to my shaded spot I went. Finally, around 7:30p, Patrick came driving up in his new Grand Cherokee trailing a cloud of dust and appologizing for his lateness. Could we still climb something? We could, it seemed. Maybe not the full Sugarloaf/Mustang Mtn/Trail Canyon Peak that we had planned, but we could pay a visit to the first of these, at least. Unsigned Forest Road 2N19 begins just east of where I had parked. We drove together in Patrick's GC because the road quickly proved unnavigable by standard clearance vehicles. It winds its way up the through the range for more than five miles, gaining over 1,500ft in the process. We passed by a few sketchy looking homesteads that might have been meth labs judging by the odd equipment stashed around the property, before entering the Inyo NF. We managed to drive within a quarter mile of the summit, only a few hundred feet below it on the south side. It was 8:10p by this time and we had less than 20min until sunset. Luckily, it took us only 10min to reach the summit, climbing steeply up through old tailings and ruins from the mining activity that took place here in the previous century. Sue and Vic Henney had left a register in 2011 which had seen only two other visitors until we arrived. One of these was Barbara Lilley who had visited in October of 2014. I was astounded at the rare find (only for the late date, not for finding Barbara's name in a register), to which Patrick responded, "Who's Barbara Lilley?" Silly Patrick. Beautiful country ! False White Mtn (Peak 12002') now officially Mt. Carl Sharsmith, honoring the veteran Yosemite Naturalist who passed away in 1994. His life story recounted by Elizabeth Stone O'Neill in her book, "Mountain Sage". Regarding the East Side 'Eateries', Matt Toomey took his KC Royals cap and opened up his own "Toomey's" in Mammoth Lakes. As far as Nicely's goes, I share your take there. A few years back, ordering a BLT with mayo 'on the side' I was quite surprised when . . . my sando was served smothered in mayo, WITH a generous 'side' of mayo ! Not so yummy. Far as I can tell, the name "Sharsmith" has not been officially bestowed on this summit. I think the main sticking point is the BGN position that new summit names in Wilderness cannot be bestowed except by Congressional action. I can attest to the fact that the name, "Sharsmith", had been in use for that peak for quite a while. When I summited in 1986, (exactly 30 years and one day prior to Bob's ascent) there was a summit register placed about 5 or so years earlier. The first entry suggested the name, "Sharsmith Peak". Dr. Sharsmith was still alive back then and, therefore, not eligible to have a geographic feature officially named for him. However, I continued to use the name, "Sharsmith Peak" for more that 2 decades. There was even a National Geographic article that mentioned Peak 12002 (FWM) as one of two mountain candidates in eastern Yosemite to officially bear his name. Then I recently discovered on Summitpost that the peak was now known as False White Mtn. I remember being a bit surprised by this since Sharsmith seemed to be a very appropriate name for this modest peak.